Topeak ranks high on a list of ingenious companies. The engineers at Topeak are passionate riders who will discover a missing or incomplete product during a bike tour and then develop and introduce this solution. From their well-known and popular "Alien" minitool, to pocket-pumps, bottle holders and child seats; you'll find everything you could possibly need in Topeak’s huge range. Each product is made to a high quality and with a spirit of innovation and passion. Topeak: prepare to ride with Bikester.co.uk! Topeak combines innovation and passion to create a wide selection of pioneering bicycle accessories - ranging from tools, bottle holders and bicycle pumps to bicycle storage solutions, panniers and bags, smartphone and tablet mounts and protection solutions. Since its inception in 1991, the company has grown to become a major player in the bicycle accessories and tools market and continues to impress with its high standards in quality product development. On the Bikester.co.uk website, you will find everything you could possibly need in Topeak’s comprehensive product range to enhance both your ride and performance. Topeak is a world-leading brand for bicycle accessories. For nearly 20 years, it has developed several award-winning product lines that help cyclists get the most out of their cycling. Innovation and research is the heart of Topeak's corporate mission and it continues to receive international recognition for its product design and ground-breaking technology. Topeak develops products that are lightweight, robust and durable. It is a company driven by cyclists and their goal is to create the best bike experience for their customers. It manufactures a huge collection of accessories including backpacks, bicycle bags, bottle holders, child seats, bicycle computers, bicycle lights, bicycle pumps, bicycle tools and more. Topeak also produces well-designed and durable bike tools. There are both home-use tools and mini-versions that are ideal for cycling because they are convenient and comfortable to carry around. The tools can be used to fix and maintain bicycle brakes, tires, bicycle chains, bicycle gears, cassettes, bicycle hubs and more. 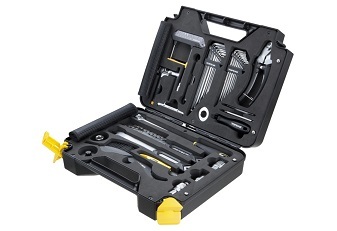 On the Bikester.co.uk website, you can find all the bike tools, pumps and accessories you could possibly need when you choose to look at Topeak’s full portfolio of products – all of which can be extremely useful when out on your bike. As many cyclists know, anything can happen during a bike ride – you could get a puncture, something from the road may get lodged in your wheels or they can even come loose on uneven terrain. With that in mind, Topeak has developed a product range with multi tools and lightweight mini tools, which are multi tools made in smaller sizes, that are easy to carry around during your ride. With this added security, you can focus on enjoying your ride. High-quality Topeak pumps come in mini and full size, including those, among others, from the JoeBlow series and Rocket series, which feature the revolutionary SmartHead technology that adapts to different types of valves to make the pumping very smooth with no need to change the nozzle. There’s also the Mountain mini pump series that incorporates TwinTurbo technology and uses both strokes to compress air and deliver high pressure output, saving on time and effort, among other models. Additional accessories on the Bikester.co.uk website include functional, innovative and stylish Topeak bike cases and panniers to keep your valuables safe and protected as you ride, as well as baskets, smartphone and tablet DryBags, RideCases and bike mounts.